Nothing says summer to me like grilled hamburgers and homemade potato salad. It remains one of my favorite dishes that I could eat for breakfast, lunch and dinner. Yes, I actually ate it for breakfast and a snack today. There are a million different ways to make potato salad, and it’s one of those things that people have a particular preference for, so I won’t try to convince you to use my mother’s recipe. 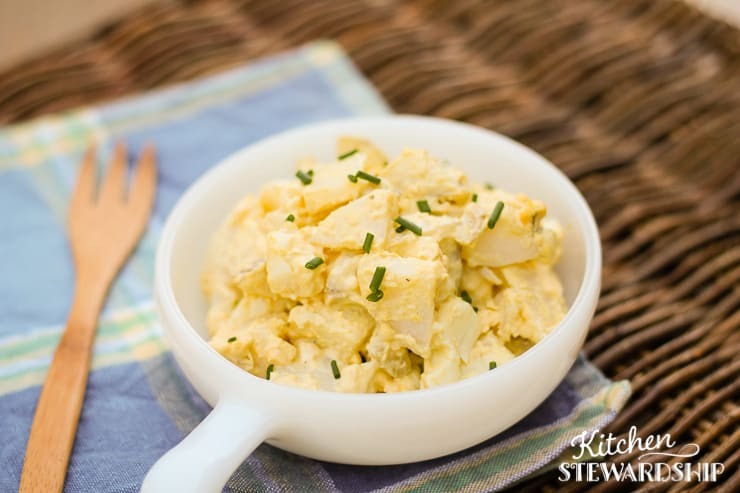 I’m just here to encourage you to use methods that will increase the nutrition of your potato salad and incorporate your kiddos into the cooking process since this is another way to get more healthy eggs into your diet. I’m a big believer in kids being responsible for chores around the house, especially in the kitchen – both boys and girls. Awww, isn’t he cute cutting those potatoes? This little guy is nearly a teenager now, and is going to make a great husband someday! He recently learned how to make tacos and guacamole all by himself. And we ended up making a whole course to teach kids to cook! It’s amazing! Yes, I know that knife in the picture looks like a cleaver. Don’t worry, I do experiment a lot in the kitchen, but I don’t give little kids sharp objects. It’s actually a cheese slicer that I found on super clearance and bought without a vision of what it would become. Here’s my whole list of kid-friendly kitchen tools. anything else he can figure out how to help me with. We worked together once to make applesauce with reduced produce apples. I cut them in half, and he was able to quarter them with his knife, then I cored them and threw them in the pot. This potato salad “recipe” is more of what I call a “framework recipe.” I’ll show you basically how to mix things up, and then you can work within that framework and proportions to tweak the recipe to your liking and add all sorts of goodies to it. Use about an equal number of hard-boiled eggs, whole potatoes, and dill pickles (fewer if they’re big ol’ whole pickles). For my family, I use 4 of each. Cut into bite-sized chunks. It tastes best without potato skins, but nutrition is best with them. Sometimes I’m too lazy to peel them! 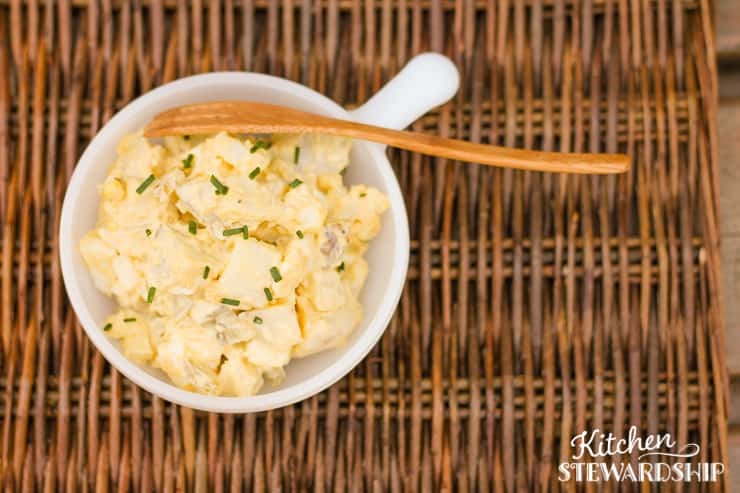 If you don’t have a favorite potato salad recipe, here’s mine – roughly. I don’t use a recipe, and you won’t need one either once you master the system. Cut raw potatoes into bite-sized chunks, then boil for 15-20 minutes until just soft (not too mushy) OR bake whole potatoes at 400F for about 45 minutes or until soft when squeezed. Potato salad tastes best without potato skins, but nutrition is best with them – your call. Sometimes I’m too lazy to peel them! Peel eggs and chop into bite-sized chunks. Mix with homemade mayo and mustard. Remember that you can always add more after tasting, but you can’t take away, so go lightly and pinpoint your personal proportions. If you can’t view the video above, click Our Favorite Dish to Pass: Potato Salad Made by the Kids to see it directly on YouTube. You can sub about half the mayo with plain yogurt, and some folks love sour cream in place of all or half the mayo too. If you don’t or won’t make your own mayo, look for a brand that doesn’t use soybean oil (yuck), and especially don’t get “Light” Miracle Whip – it has artificial sweeteners! Toss in a splash of pickle juice to add zing! Many people add chopped raw onion, radishes, or celery as well. Make it pretty with a sprinkle of any fresh herb, or just dried parsley like I used in the photos. What to do with the peels? Make potato crispies, of course – recipe in Healthy Snacks to Go. Eggs hard-cooked in the Instant Pot are the easiest eggs to peel I’ve ever come across. Again, make sure you have clear-cut areas for peeled eggs, cutting the eggs, and putting the pieces. Decide if you want them to cut the entire egg and then move the pieces to the bowl, or move each slice as they cut it into chunks. Do it the same every time. Cook your potatoes first. 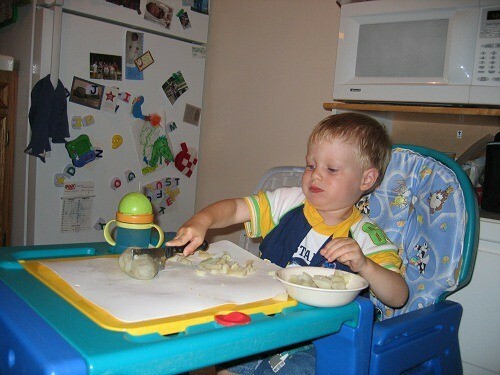 It’s easy for kids to cut cooked potatoes into chunks; raw ones, not so much. It’s nice to have “quick” potato salad, too, when both potatoes and eggs are cooked and cooled and ready to go before dinner. Added bonus: baking potatoes in their skins retains the most nutrients; boiling them whole is second best. Most people tend to peel and slice their potatoes first, then boil them. 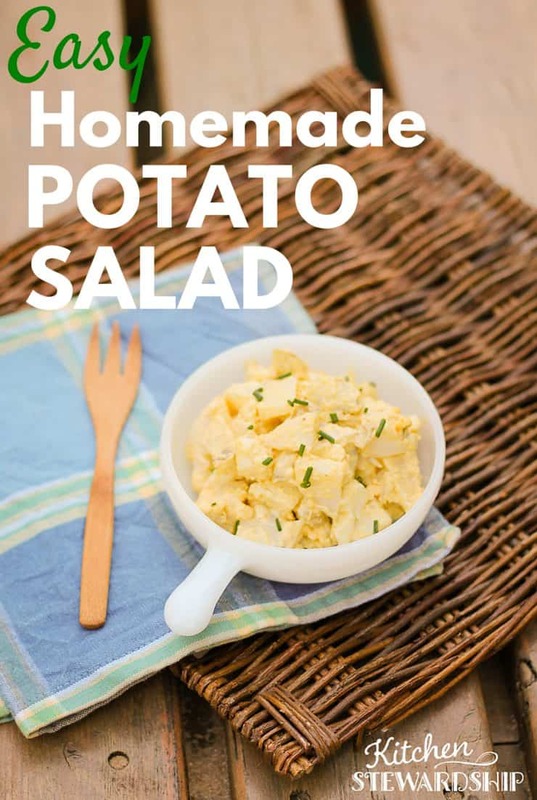 This loses the most nutrients, leaves the kiddos out…but it does taste more “standard” in potato salad and it’s the way to go if you need the job done in 20 minutes. If you bake potatoes without wrapping in foil, the skins will almost peel off without a peeler. The child can usually complete 80% of the job and you can finish with a knife. Like with the eggs, have a process for peeling and where to put everything. Demonstrate it precisely the first time. Talk the child through it. The time you spend now will be recouped when you can say to your 3-year-old, “Peel and cut those potatoes for the potato salad, please!” and it actually happens! Watch the child do the work, especially the first time. Wait a moment before responding if you see a mistake. They may catch it themselves! Don’t forget to allow for little errors that won’t change the outcome of the meal. Save those peels for potato crispies! Cooking with my kids gives me a chance to praise them genuinely and teach the values of hard work and teamwork. Did you like this framework recipe for potato salad? 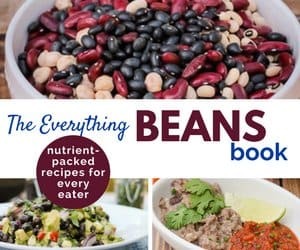 If you’re still a little unsure, my newest book, Better Than a Box, teaches how to adapt just about any processed recipe for real food and tweak things to fit your tastes. I’ve learned to experiment successfully in the kitchen, and I’ll teach you how (and you can use the code POTATOSALAD to take $5 off the price, too). What’s your signature dish for potlucks and parties? Why? I would love to hear some more about how you incorporate the children in what you are doing. I have a very busy almost 2.5 year old and almost 18 month old that I would love to have ‘helping’. I am definitely going to try this out with the cutting. I am also very curious to hear what kind of mixture/ratio you use to clean the floor with vinegar and water. I have been researching ideas and recipes for homemade cleaners. Thanks! I am definitely planning some posts about how to let the children help in the kitchen. A lot of it depends on your style and what you do in the kitchen, as well as your tolerance level. Teaching them to cut is a great place to start though, and I would start with a banana. My little guy helps A LOT with baking – pouring ingredients into the bowl, mostly, but he likes that he gets to help on every step. He also loves to push the buttons on our blender! For vinegar and water, I just pour a “dollop” into my 32oz. spray bottle and fill the rest with water. I use full strength vinegar to clean the shower and toilet. Definitely not rocket science! For sanitizing, I use 50/50 hydrogen peroxide (the drugstore kind) and water in one bottle and vinegar in another. In August or September I’ll be posting on homemade/green cleaners, if you can wait that long for more info! What is the green herb that you sprinkled on top?